Homecoming events are sponsored by the Alumni Association, Office of Campus Life, Student Activities Advisory Team (SAAT), Student Government Association (SGA), Students Today Alumni Tomorrow (STAT), G101.3 and Reid Health. Homecoming 2016 begins at 11 a.m. on Monday, October 31, with Monday Madness. Students will enjoy free food and receive their Homecoming t-shirt in the Springwood Hall Graf Center. The SGA Sculpture Contest will be held throughout the day. For the Sculpture Contest, campus organizations, offices and departments will create a sculpture out of canned goods that will then be donated to the IU East Food Pantry located in the Center for Health Promotion. Later that day, students are invited to join the student section and become a Howl Crowd VIP. Students receive free pizza and Rally Towel. Howl Crowd 101 begins at 6:30 p.m. at the Student Events and Activities Center, just before the Red Wolves men’s basketball game versus IU South Bend. Tipoff for the game is at 7 p.m. During halftime the Homecoming Court will be announced. On Tuesday, November 1, it’s the Black Out volleyball match and Senior Night at the Student Events and Activities Center. The Red Wolves will play Ohio Christian University. The match begins at 7 p.m. The first 100 fans receive a free Black Out shirt. IU East students are admitted free with their Wolf card. Red Wolves Spirit Day is Wednesday, November 2. Wear Red Wolves gear in support of the campus. Then on Thursday, November 3, the Talent Show will be held from 5:30-7:30 p.m. in Vivian Auditorium and will feature student acts. Students, faculty, adjuncts, staff and alumni are welcome to attend. Following the Talent Show, the Student and Alumni Bonfire will begin at 7:30 p.m. behind Hayes Hall. 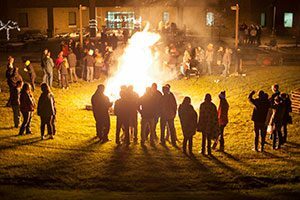 During the bonfire, IU East will crown the Homecoming Queen and King. Winners from the Talent Show and the Sculpture Contest will also be announced. Homecoming will conclude with the Wetzel Auto Red Wolf Classic held Friday, November 4, and Saturday, November 5. On Friday, the men’s basketball team will play at 4 p.m. followed by the women’s game at 6 p.m. at the Student Events and Activities Center. During the halftime of the women’s game, celebrate Rufus the Red Wolf’s Birthday. Saturday the women’s game is at 3 p.m. followed by the men’s game at 5 p.m. Admission for the weekend tournament is $5 for eight games. For the full tournament schedule, visit iueredwolves.com. The Wetzel Auto Red Wolf Classic is presented by Reid Health, G101.3 and Best Western. IU East student, faculty and staff event. IU East student event. Free Homecoming shirt and food. IU East student event. Free pizza and Rally Towel. 7 p.m., Student Events and Activities Center. Free shirt. 5:30-7:30 p.m. in Vivian Auditorium. Student, faculty, staff and alumni event. IU East students and alumni are invited to the homecoming bonfire. Homecoming Queen and King will be crowned. SGA Sculpture Contest and Talent Show winners announced. 2 p.m. Games begin at the Student Events and Activities Center. 4 p.m. Red Wolves men’s basketball game. 6 p.m. Red Wolves women’s basketball game. Rufus’ Birthday at halftime. 11 a.m. Games begin at the Student Events and Activities Center. 3 p.m. Red Wolves women’s basketball game. 5 p.m. Red Wolves men’s basketball game.